Remember when Marina Abramović put on this extraordinary art exhibition in New York’s MoMA back in 2010? 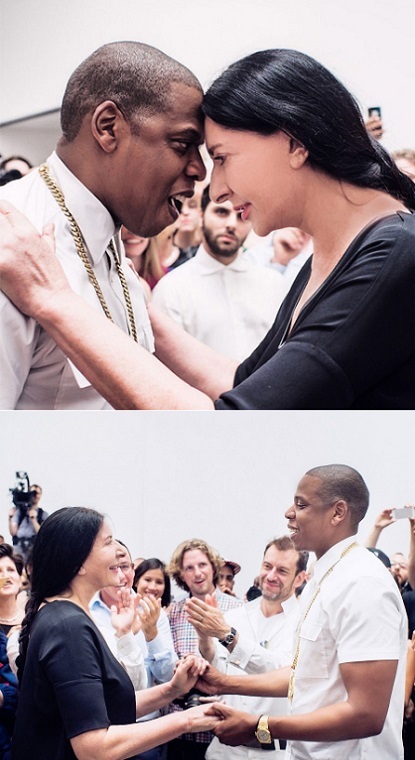 Well a few months ago Jay Z did something similar, yet totally different at the PACE Gallery in New York. He performed his new tune "Picasso Baby" over and over and over again for six hours straight to a room filled with tons of talent, from actors, artists, writers, musicians, collectors and even art critics. Have you heard about it? He sang the song face-to-face to many of the attendees in an attempt to create a personal connection and shared energy. P.S: What extremely successful people were doing at age 25. P.P.S: Guardians of Russian art. That sweet older lady is my fave too. I would definitely call this art. Oh and there´s even Jenna Lyons from J.Crew standing in line. I despise Jay Z...have you read the lyrics to his songs? Such talent. If he is the modern Picasso then we have fallen so low...so, so low. Martie, oh yes...She looks adorable, doesn't she? Btw: That sounds perfect! I woke up to this post today.... Love it!!! Mary Jo:) Me too...It looks like it was so much fun!